We have the most expansive surface testing instruments to meet your most challenging application requirements. Surface testing instruments are used in a wide range of designing, testing, and quality control applications. Hardness testers are designed for measuring the hardness of metals and ensuring compliance standards. Durometers measure the harness of rubbers and plastics and measurements are typically displayed in Shore A, D, and C measurement units. A thickness gauge uses non-invasive methods such as ultrasonic waves, eddy currents, or magnetic induction to provide high-precision measurements of coating or wall thickness. The type of coating thickness gauge that works best for you will depend on both the type of coating you are measuring as well as the type of material behind the coating. You can get a thickness gauge for use on either metallic or nonmetallic surfaces, and some models will work with both. 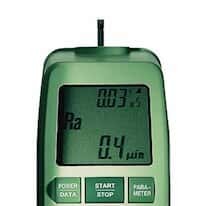 Ferrite content meters are a fast, rugged, and accurate handheld solution for measuring ferrite content. Through the use of a plug-in smart probe, ferrite content meters provide quick and precise, nondestructive measurements. Using the magnetic induction method, units are capable of measuring normal constructional steel with austenitic chrome steel welded cladding, austenitic stainless steel and duplex steel, providing insight into future mechanical and corrosion-resistant behavior.